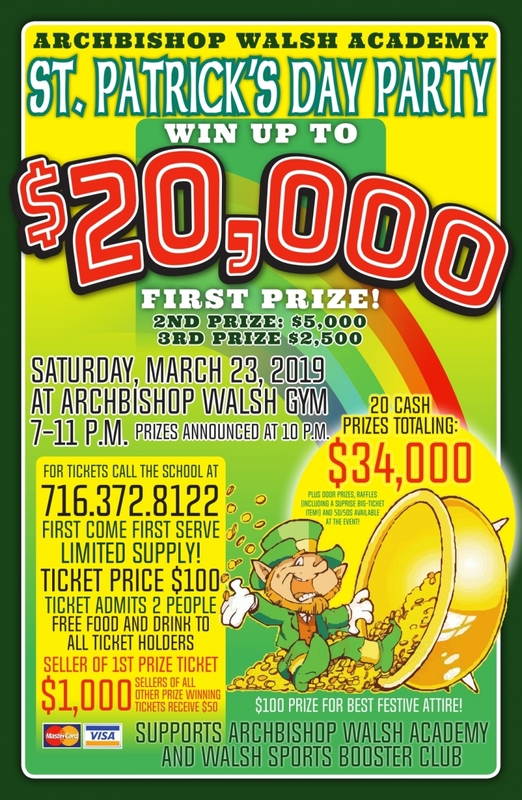 Archbishop Walsh Academy and the Walsh Sports Boosters Club will host their annual St. Patrick’s Day Party and Raffle on Saturday, March 23rd from 7:00 pm to 11:00 pm at Archbishop Walsh, 208 North 24th Street. Tickets on sale now! The event welcomes over 700 guests and raises nearly $100,000 each year. 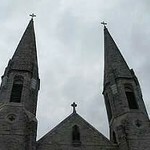 It has become one of the school’s largest fundraisers, supporting academic and athletic programs for students at Southern Tier Catholic School and Archbishop Walsh Academy. There is a limited number of tickets available and they are sold on a first come, first serve basis. The St. Patrick’s Day Party and Raffle includes 50/50 drawings, lottery ticket chances, a betting wheel and the chance to win the grand prize of $20,000. Other cash prizes throughout the night include $5,000, $2,500, (2) $1,000, (5) $500, and (10) $200; a total of $34,000 in cash prizes will be awarded throughout the evening. Tickets to the event can be purchased for $100 for two attendees and entitle eligibility for all cash prize drawings as well as an open bar of wine, beer and soda, and a beef-on-weck dinner. The event will feature a guest DJ as well as a live performance by the Olean Area Irish Dancers. Tickets can be purchased at: Worth W. Smith, 1624 W. State Street in Olean, STCS/Walsh School, 208 North 24th St. in Olean, or online at www.stcswalsh.org. Additional information regarding the Archbishop Walsh Academy, St. Patrick’s Day Party and Raffle can be found by visiting stcswalsh.org or by contacting the school directly at 716-372-8122.